Nowmee Syeda Shehab spent just three years at Emory College, yet she managed to program two national conferences; link several groups, both on and off campus; and help influence the University’s decision to provide financial aid for undocumented students who meet the guidelines of the Deferred Action for Childhood Arrivals immigration policy. For all that she accomplished, Shehab is the 2016 recipient of Emory's highest student honor, the Marion Luther Brittain Award. Emory presents the award each year to the single graduate of any of its nine schools who has demonstrated exemplary service to both the University and the greater community, without expectation of recognition. Candidates are required to demonstrate a strong character, meritorious service and a sense of integrity. Shehab will receive the award, which also comes with $5,000, during the central Commencement ceremony on May 9. Shehab displays typical humility when acknowledging the honor, saying the tribute belongs to every student, faculty member or staffer who worked on projects with her. Emory wasn’t the plan when Shehab graduated from Brookwood High School in Snellville, Georgia. After moving with her family from Dhaka, Bangladesh, when she was 16, she wanted to follow in her older brothers’ footsteps and go to a small liberal arts college. She attended Smith College in Massachusetts for a year, but realized the school was too far off the beaten path for her liking. Shehab then spent a gap year volunteering as a teacher assistant and tutor for City Year, an education nonprofit working to address high school drop-out rates, in the underserved population of Dorchester in Boston. Together, those years taught her that she wanted to study in a more urban environment and pursue her passion for social justice. Emory College’s tradition of a liberal arts education wrapped into a major research university fit the bill. That her father died just before she was about to start her sophomore year solidified that she’d made the right decision to move close to home. She wanted, she told leaders there, to focus on safety and advocacy issues. Hired as a programming assistant, she did just that. With the Office of Health Promotion, she twice organized a team of five others to plan RespectCon, a national conference on sexual violence prevention, as part of the Respect Program. Both times, the conferences examined the issue through a social justice lens, viewing it not just as interpersonal violence but a larger problem of race, gender and class — all of which affect victims’ decision to report crimes. “I think this was just an opportunity to use my skills, because I’m good at organizing and time management, to help multiple communities,” Shehab says. The groups that Shehab connected only grew over time, says Danielle Steele, interim director of the Center for Women. This year, for instance, she ran the center’s Community Needs Assessment and helped with a Girls in Sports Day, which brought 50 students from an Atlanta middle school to Emory to talk about exercise, body image and nutrition while also exposing them to a college environment. Shehab says that she is most proud of adding her voice to connect and advocate with Freedom at Emory. The chapter is an outgrowth of Freedom University, an Atlanta nonprofit that offers tuition-free, college-level courses to undocumented students in Georgia. A handful of professors and activists founded the program in 2011, after the Georgia Board of Regents adopted rules to bar undocumented students from some public universities and require steep out-of-state tuition at others. In 2014, Freedom at Emory began working in collaboration with undocumented students in an effort to encourage Emory, as a private university, to openly accept academically qualified undocumented students and provide financial aid to students who are deemed lawfully present in the United States under the Obama administration’s Deferred Action for Childhood Arrivals (DACA) program. 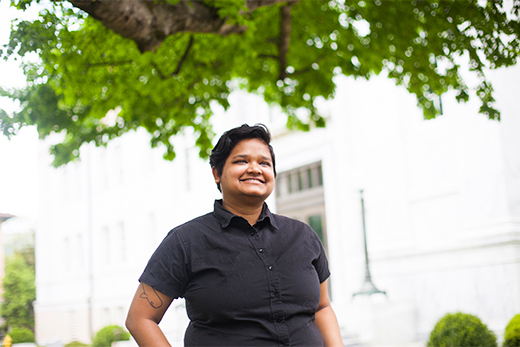 Shehab joined Freedom at Emory after realizing she knew some members from her earlier advocacy work — and even from high school. Some thought that, as a documented immigrant, she had nothing officially to gain. She saw it differently. The campaign worked. In April 2015, Emory announced that it would begin offering private, need-based aid to undocumented students who meet the guidelines of the Deferred Action for Childhood Arrivals immigration policy. Shehab’s contributions were not just writing opinion pieces and talking to administration officials, says Laura Emiko Soltis, Freedom University’s executive director and a 2012 PhD graduate of Emory. On campus, Shehab continued to tackle leadership roles and win awards. She earned the 2014 Unsung Heroine Award and the 2015 Fierce Leadership Award. But she also began setting her sights on a far bigger community. She traveled to the nation’s capital and worked as a legislative intern with U.S. Rep. David Cicilline, D-Rhode Island, as part of the Victory Institute’s 2014 summer program. Last summer, she returned to Washington and served as a policy intern with another advocacy group. In both internships, she got a behind-the-scenes look at how advocates work within the system on immigration issues. Congress may not have been able to pass immigration reform, for instance, but she watched as individual politicians helped individual immigrants. Movement, she says, is possible because of people who understand the technical and policy issues at play. The experience has made her want to attend law school, and she will spend the next year working as a paralegal in a D.C. law firm that works on federal issues such as immigration. Emory helped her open those doors, she says, by encouraging her curiosity about history and inequality and providing her with a vast network she could create into her community. She hopes to do the same on a national scale.